Happy Monday, I hope your weekend went well. The markets has to digest over the coming two weeks, and that is discounting the Brazilian beef and Brexit stories that developed over the weekend. The livestock markets will be front a center for a few days, starting with cold storage on Wednesday, Livestock Slaughter on Thursday and Cattle on Feed on Friday.The big grain reports come out a week from Friday, but you can expect the market to gyrate on expectations and of course, South American weather. As I mentioned above, there are two stories developing this morning out side of the traditional row crop markets that could have a bleed over effect into the trade. The first is a story that developed out of Brazil on Sunday. Apparently, Brazilian police have unveiled a scheme to bribe federal meat auditors in exchange for sanitary permits to rotten beef and poultry containing cardboard fragments. This is the kind of story that can bring the industry to it’s knees. The story is still in very early development and its important to note that no reports of illness have been reported anywhere with this as the cause, but at this moment the country who controls 1/5th of global beef and poultry exports is under heavy scrutiny. The US markets have seen increased beef exports in January after a very solid Q4. This could create even more demand for US beef. In the long run, any increase in demand for US meat exports should bleed into feed demand. Be careful in the cattle markets today. Over on the CBOT, we saw a positive start to the week amid a the lack any hedge pressure Sunday evening, and with funds unwilling to ramp up selling following last week’s CFTC commitment of traders data. 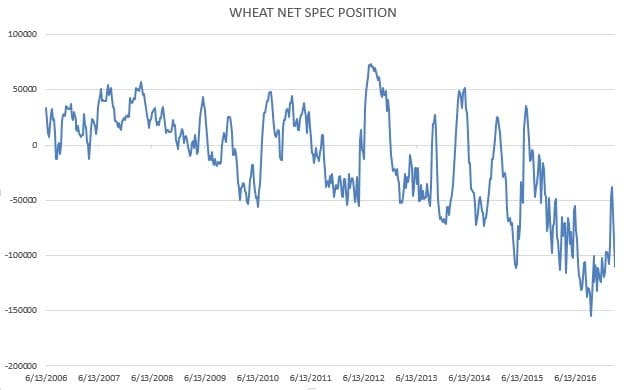 The funds are back short 100,000 + contracts of SRW again which gives me a very good feeling being long wheat right now (long KC July from 450-460). 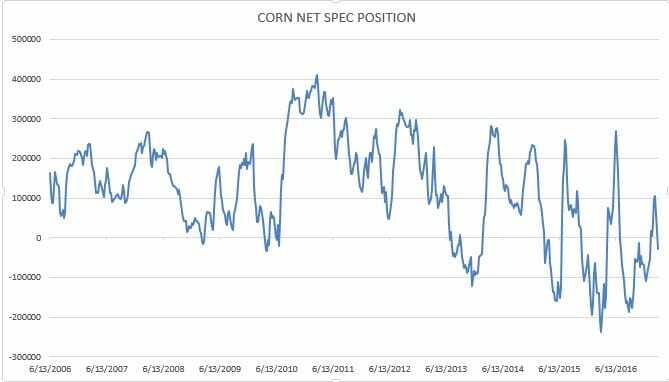 Corn markets see funds return to a net short position again for the first time since late February although they are well off their recent lows. The COT has shows spec blood letting in almost every market except for cotton. Cotton OI remains record long. 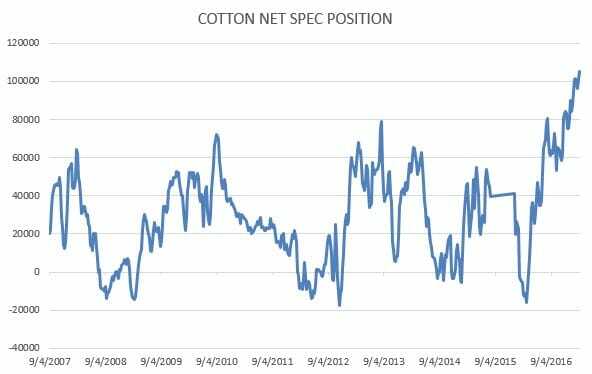 These spec longs in cotton are relentless, waiting this market out in a fashion you do not see very often. 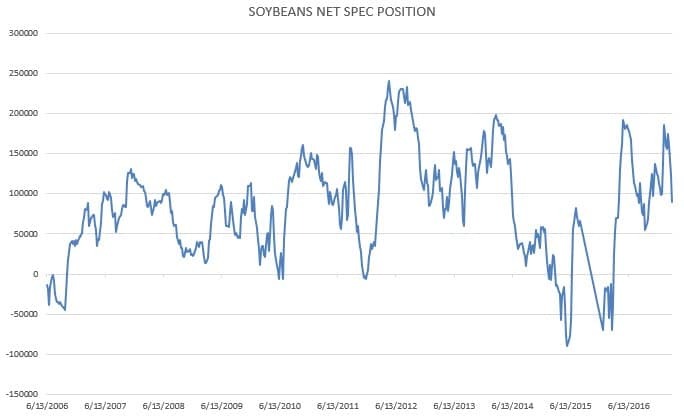 You could look at it two ways, there is a ton of fuel to push prices lower OR this cotton spec behavior is something we should look forward to if beans, corn or wheat ever get a good bullish fundamental story. I would remain in hedges for cotton, the difficult decision will come if prices break a nickel and the spec position has regressed. The newest model runs show rain totals of just .10-.25” across far W KS and the TX & OK panhandles, but the remainder of the Plains will see needed moisture of .75-1.50”. Tough to say what it does to winter wheat conditions there. Reminder that conditions will be released weekly in KS, TX and OK moving forward. Brazil’s soy harvest should reach 70-75% complete this week. Argentine corn harvest should reach 15-17% finished,particularly in Brazil, continue to find their way to major markets. US export offers are only a couple of dollars higher than Brasil but almost 12 dollars per ton higher than Argentina. There is talk that the Argentine Grain Union has planned a strike for April 6th, and workers at the port of Rosario in Argentine will strike for 24 hours on March 30, but so far labor problems in S America have not been the issue it has in recent years. The South American forecast continues to look good as Brazilian rainfall as models show little problems. Better rain chances return to Parana in the southern Safrina belt by late next week, and as such CONAB’s April report is likely to hike total Brazilian corn exports another 1-2 MMT without any problems being reported. Bottom line is that little SAM news is expected to reduce supply in coming weeks. By May, if little has changed you can expect SAM supply to crowd on the US corn markets, but until then we remain the best and cheapest offers out there. I would look to sell May corn if you need to move by April at target levels near 380 and 390 May. I think we could see money flow push prices to those levels, but without US planting problems I don’t see markets trading much above those levels longer term. We will remain long KC wheat – July, as a spec play and short June and Oct hogs against a long April hog. I like buying SD bean puts ahead of next Friday’s report but you have time. Call or email if you need anything.